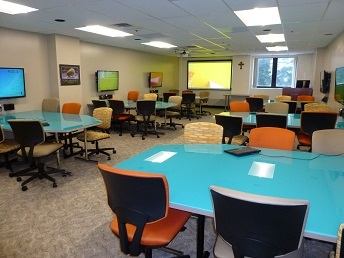 Designed for active learning, FlexTech classrooms provide a unique environment for group learning and collaborative activities. Each room is designed with several student pods. A pod seats anywhere up to six students and has its own resident computer connected to a wall mounted flat panel monitor along with connections for two additional devices (HDMI and VGA) , USB charging stations and the ability to share digital content throughout the room. All rooms (except 308 Rockwell) have writeable glass top tables. 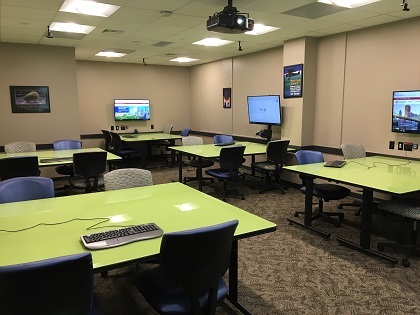 In addition to a standard instructor's station, a large main display (projector or LCD monitor) completes the room. View the instructions to understand the operation of the room.